An upsurge in malaria is likely to have serious consequences for people in Orientale province in DRC unless immediate action is taken. A child is tested for malaria in Orientale Province. APRIL 25, 2013—An upsurge in malaria is likely to have serious consequences for people in Orientale Province in Democratic Republic of Congo (DRC) unless immediate action is taken, the international medical humanitarian organization Doctors Without Borders/Médecins Sans Frontières (MSF) warned on World Malaria Day today. Mosquito nets and medical supplies are urgently needed as the rainy season approaches in a region where malaria is one of the main causes of death. Tackling recurrent outbreaks demands a firm commitment from Congolese health authorities and aid organizations, MSF said. “Too many health centers lack the supplies necessary for coping with a new outbreak, and this is completely unacceptable,” said Dr. Narcisse Wega, MSF emergency coordinator. A measles epidemic is also forecast to hit the province, putting children under five at the most risk. Last year, MSF took emergency action to respond to a dramatic increase in severe malaria cases in the districts north of the city of Kisangani. In the areas of Ganga-Dingila, Buta, and Aketi, MSF provided outpatient malaria treatment to almost 60,000 people and inpatient treatment to more than 3,500 people. Two mortality surveys carried out by MSF in 2012 showed extremely high mortality figures among children under five. In Pawa region, malaria killed more than one in 10 children. This is far from a unique situation in DRC, where outbreaks also occurred in the provinces of Maniema, Equateur, and Katanga. Major deficiencies in the health system had contributed to the 2012 outbreak’s severity. The same situation can be seen this year: mosquito nets are not being sent to vulnerable areas, and there are shortages of rapid diagnostic tests, drugs, and equipment for carrying out blood transfusions—vital for children suffering from anemia caused by malaria. These vital supplies are still not listed in the supply list drawn up by donors. The cost of health services in DRC also prevents many people from accessing the treatment they need. 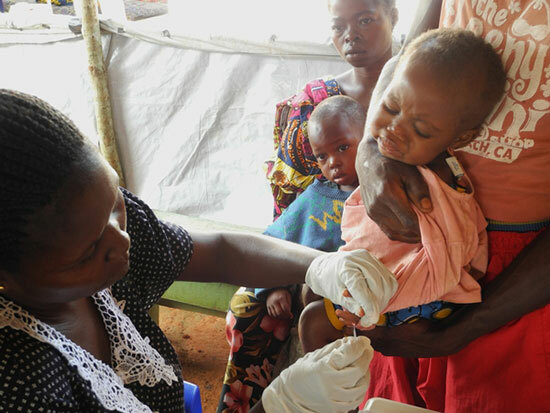 MSF calls for urgent action by all those involved in the fight against malaria in DRC. Adequate treatments and rapid diagnostic testing must be available as soon as possible in the remote areas of Orientale Province, while preventive measures such as the distribution of mosquito nets must start immediately, before the peak malaria season gets underway. MSF has been working in Democratic Republic of Congo since 1981. In 2012, MSF treated more than 500,000 people for malaria throughout the country, including large numbers of children under the age of five.